An innovative and unique studio beechwood easel which has been created for use with all forms of media. It can be tilted backwards into a horizontal position for watercolours and the application of picture varnishes or forward for pastel and oil and acrylic painting. In addition to this tilt function, the whole canvas carriage can be moved up and down meaning the artist can stand or sit when painting. 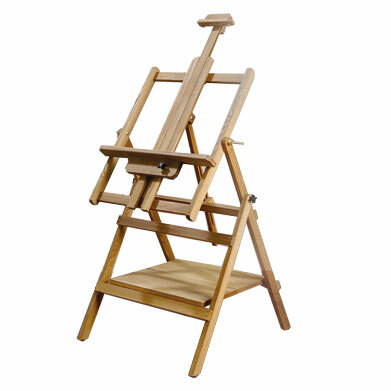 The easel has a useful storage shelf built into the base, and can be folded down flat for easy storage. Made from Beechwood. This easel is great for artists who work with all media including Watercolours, Oils and Acrylics.